Venus appears to have been very popular amongst the plebian class of Roman society, as evidenced by the existence of temples in areas of the city which were traditionally plebian rather than patrician. A cult to her aspect of Venus Erycina existed near Rome's Colline gate; in this guise, Venus was a goddess primarily of fertility. Another cult honoring Venus Verticordia also existed between the Aventine hill and Circus Maximus. "Venus' month was April (the beginning of spring and fertility) when most of her festivals were held. On the first of April a festival was held in honor of Venus Verticordia called Veneralia. On the 23rd, Vinalia Urbana was held which was a wine festival belonging to both Venus (goddess of profane wine) and Jupiter. Vinalia Rusticia was held on August 10th. It was Venus' oldest festival and associated with her form as Venus Obsequens. September 26th was the date for the festival of Venus Genetrix, the mother and protector of Rome." Similar to Aphrodite, Venus took a number of lovers, both mortal and divine. She bore children with Mars, the god of war, but doesn’t seem to have been particularly maternal in nature. In addition to Mars, Venus had children with her husband, Vulcan, and when conflated with Aphrodite, is commonly believed to be the mother of Priapus, conceived during a fling with the god Bacchus (or one of Venus' other lovers). Scholars have noted that Venus doesn't have many myths of her own, and that many of her stories are borrowed from the tales of Aphrodite. During the early paleolithic period, people carved small female figurines to which later archaeologists gave the name Venus figurines. They're typically curved and rounded, thick through the middle, and often have no faces, just voluptuous womanly bodies. Perhaps the best known is the statuette originally called the Venus of Willendorf, now known as the Woman of Willendorf, or Willendorf Woman. In recent years, scholars have shifted away from calling these pieces Venuses, because they bear no relation to the goddess Venus; in fact, they predate her by many thousands of years. In contemporary artwork, Venus is nearly always portrayed as young and lovely. 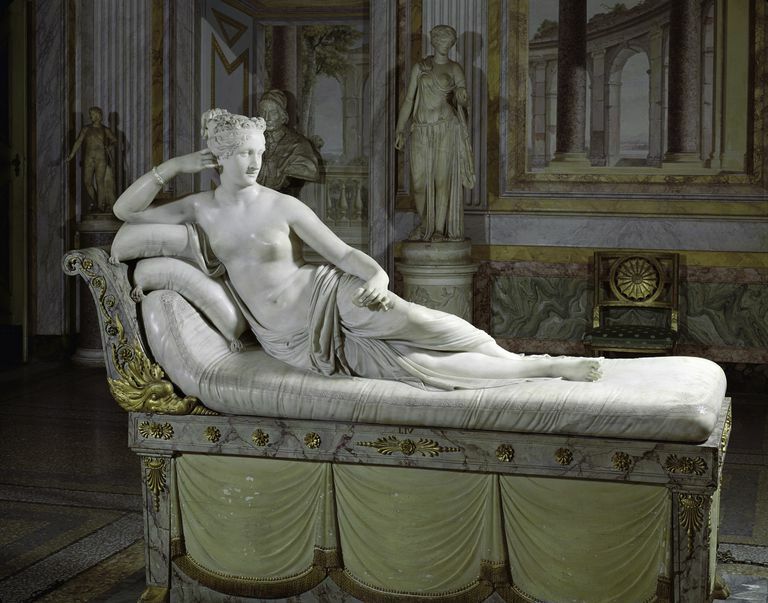 Throughout the Classical period, a number of statues of Venus were produced by different artists. The statue Aphrodite of Milos, better known as the Venus de Milo, depicts the goddess as classically beautiful, with womanly curves and a knowing smile. This statue is believed to have been done by Alexandros of Antioch, around 100 b.c.e. Chaucer wrote regularly of Venus, and she appears in a number of his poems, as well as in The Knight's Tale, in which Palamon compares his lover, Emily, to the goddess. In fact, Chaucer uses the turbulent relationship between Mars and Venus to represent Palamon, the warrior, and Emily, the lovely maiden in the flower garden.